The art workshops were wonderful to me. I got to express my tastebuds. My favorite part was when I got to draw. I love to draw! When I was painting I saw all the colors, I felt so free. I actually felt like I was in the picture. The art workshops were fun because it got me to eat more fruit and we got to paint and draw what we saw. Also now that I started drawing with Mr. Copeland, I can't stop. Now I draw everywhere I go... I loved to try the fruits and veggies Ms. Sanders brought. To tell the truth I like to eat. I learned new things about the fruits and veggies. The art workshops were exciting. I was enthusiastic and optimistic at the same time. Learning about different fruits and vegetables that I've never seen before and also to be able to taste them at the same time is amazing. Then we got to draw them. Afterwards we got to create a background. We used a lot of artistic materials such as watercolors, tempera paints, lead pencils, and colored pencils. In art workshops, students closely observe and investigate local produce. 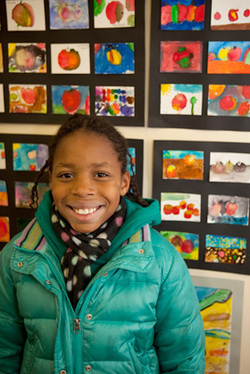 They hone their art-making skills —drawing, printmaking, collage— and learn to think imaginatively. Students discover that carrots can be orange or white, are in the family of vegetables called taproots, and contain vitamin A to help us see, and antioxidants to keep us healthy. Students realize that we eat all parts of a plant: roots, stems, leaves, flowers, fruit, and seeds. Broccoli and cauliflower are flowers that provide the vitamins we need for our immune system, bones, teeth, and brain. The art workshops were very healthy and I got more into fruits and vegetables. Now I eat fruits and vegetables twice a day.